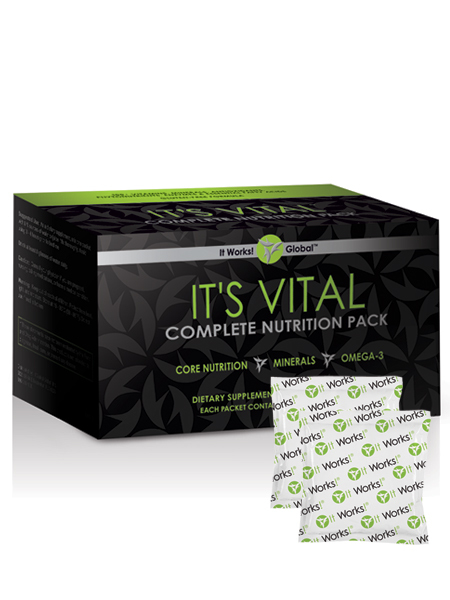 Our It Works It’s Vital Nutrition Packs are great for your overall nutritional health needs. Our nutrition packs help to meet all of your daily vital nutrition needs with added nutrients and minerals, superior calcium absorption and triple strength support for heart health all in just one pre-measured daily pack. These are one of my favorite products because it gives you all the nutrients that your body needs every day to stay healthy and it comes in just one daily packet! How easy is that? Now, what’s included in each pack? Our It’s Vital Minerals is a great premium mineral blend with over 74 trace minerals! It is an amazing support for healthy bones and teeth and gives you 250% the RDA of Vitamin D. Because we have Vitamin K2 in our minerals, it helps to keep your heart and bones strong while minimizing arterial calcification! Our It’s Vital Omega-3 is just fantastic! It helps gives support for healthy joint movement and helps the body respond easier to minor inflammation. There are what we like to call fish-oil derived DHA & EPA fatty acids to help maintain and support healthy cholesterol levels. It is a lemon-flavored soft gel which makes it tastier to use and definitely helps make it easier to swallow! This is our gluten-free and plant-based product. It is one of my favorites because we use a patent controlled-release technology that allows for us to feel nourished all day. The mind/body energy blend helps you to stay energized and sharp mentally and physically even on those days you wake up feeling groggy and blah. Our improved metabolic support helps boosts our body’s natural ability to burn calories. Are you ready to feel more energetic and use our It’s Vital Complete Nutrition Pack? Order now and see the difference in your body!